Last edited by Kingston73 on Wed Jan 30, 2019 12:52 pm, edited 1 time in total. Welcome to MX Linux. You came to the right place. Coming from a former Windows user MX Linux should be good for you. Yes, beginner can start out with MX. It's setup not much differently as in Ubuntu or Mint. I'm very impress with all the MX-tools. I'm also very impress of the MX manual. Everything you need to know is in there. I been recommend MX in all Linux forums. I haven't got complaints that this is bad advise or even bash by other Linux users. I believe it's true. Matter of fact I know it's true. 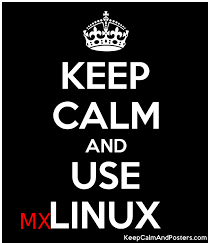 Enjoy MX and the Linux community. Welcome to the community. On the face of it, a five to seven year old laptop should be right in MX 18's sweet spot. I suggest that you read the MX user manual as a prelude to installation. Think of it as giving yourself a leg up on the journey. Hello, I use laptop from at least 2012 (it was bought then), its specs can be found below in my signature, and MX is perfect, no question about it. I've started in September 2017 with MX-16, next was 17 and now is 18. I use it for Internet, music, video (watching and editing), graphic, DVB-T, reading and for hundreds other things (everyday I'm finding new applications and programs), generally for everything. That's the way system should be. I have also MX-18 on nearly 15-years old desktop (you can see specs in signature as well), it works and is useful. Yes, I think MX is good for a new Linux user. You probably won't need to do anything more than boot a Live USB and then install to the hard disk. (I always partition my hard drive so I can have more than one version installed on the same machine, but that is not necessary). The installer is really quite easy to use, especially if you read the manual first. It is similar to Xubuntu, but I think easier. And the community is very friendly and patient. Go ahead and install it on a Live USB and give it a try. You'll like it. Been using MX Linux 17.1 for little over a year now as a LiveCD (probably the longest 'test-drive' ever), and I'm very happy with it. I have XP Pro installed on my main HDD, and as soon as my tech guy recovers from a broken back, I'll have him over to install MX on the secondary HDD. Over the previous couple years I probably tried out at least 20 distros (as a LiveCD), and only two of them worked out of the box....all the rest required the sort of fussing with that a non-linux user is unable to deal with. Some would not boot from a LiveCD on their own; some would boot, but not connect to the internet without requiring me to mess with it, and on it went. Only MX Linux and Linux Mint boots on their own, and connects on their own. Both require a little setup after that (turning on the firewall, turning the gawd-awful screensaver to max time, getting a decent background, and pulling the fangs of privacy-invasive Firefox), which is where MX Linux leaves Linux Mint choking in the dust. MX Linux is so easy to configure even a M$ user can figure it out. Take a look at the YouTube videos of Linux Mint & MX Linux to see the difference. As for Ubuntu, I'd trust it not much further than Win10. Ubuntu-based distros might be kosher, but Canonical has already shown a disregard for its endusers privacy, in much the same way as M$ has since nearly day one. Very good for a new user. I started out with it back when it was still Mepis, tried a few others, went bleh this is too hard and never looked at anything else again. First of all Welcome to MX family. MX is the best for beginner and believe me its no advertising. I can assure you that the forum is any time available for your help and no one will hurt your self-ego even if the answer to your question is very very silly unlike other places and you are going to get a perfect answer as per user level of understanding. I will suggest you to read MX User manual before installing and After that its so easy to do your things and MX as an OS will never come between your work. You will find MX very simple but efficiency and usability very high and most of all Its stability. If you have any further question please feel free to ask in forum. If your dual booting or cant decide how to partition excellent knowledgeable and helpful persons are here.